Lexington, Ky. - Nov. 29, 2017 - For the second year in a row, Louise Leatherdale and Leatherdale Farms received the prestigious Adequan/USDF Dressage Breeder of the Year award. Leatherdale Farms has long-since been recognized for its high-quality Hanoverian breeding program both in the United States and in Germany. In addition to their breeder award, many of Leatherdale Farms' young horses received recognition in the Horse of the Year awards and American Hanoverian Society year-end awards. With an impressive median score of 192, which was nearly 100 points higher than the next breeder, the breeding program was rewarded by the impressive averages of several sport horses all sired by Leatherdale Farms' stallions. Duchess L, Hero L, Hannigan L, Fleur De Lis L and Fighting Chance L had outstanding seasons that contributed to the farm's success. "The Leatherdale horses are very talented and the top breeding is evident in the creation of very intelligent and athletic horses," Leatherdale Farms' young rider Mike Suchanek said. He also credits the teams' success to the pride Leatherdale and her late husband, Doug, had for their operation as well as their dedication and passion for the horses. "Doug and Louise really took their time and did their research to hand pick the lineages, as they wanted to create a line of horses that were talented but also had great minds," Suchanek explained. "Louise is a very special woman - she carries on the passion that Doug also had for this sport and for the horses. She wants the very best for her horses and she cares just as much about the people she hires as she does her amazing animals! "To have found such a generous and passionate owner and breeder that I can ride and train horses for has been an opportunity of a lifetime and a dream job!" Suchanek concluded. "I'm so excited I was able to help earn Leatherdale Farms another Breeder of the Year award! I'm so honored to be a part of Doug and now Louise's passionate endeavor!" 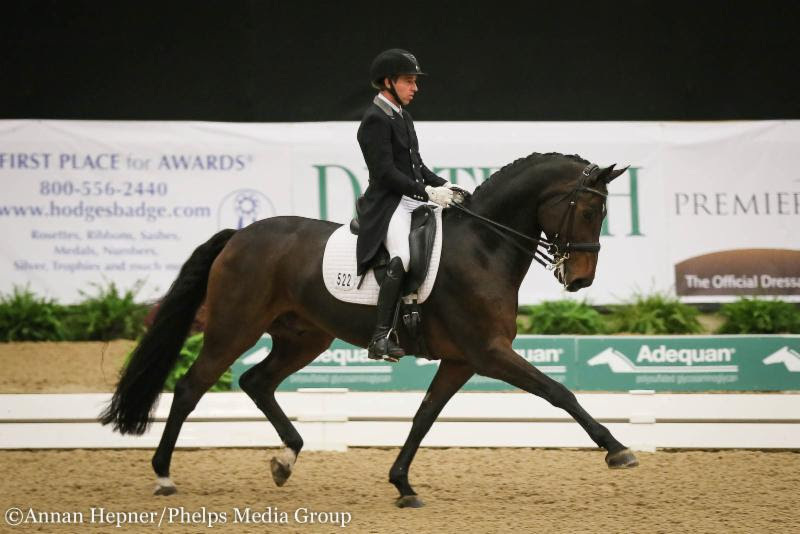 Earning the reserve championship for the Adequan/USDF Prix St. Georges Dressage Horse of the Year was the 10-year-old Hanoverian gelding Hero L (His Highness-Waterlily L, Wolkenstein II) with a median score of 74.935 percent. In the American Hanoverian Society's All-Breed standings, Hero L won the Intermediate I Open division with a median 69.649 percent and won the Prix St. Georges Open division. "They are happy horses and I try to instill in them a sense of confidence every time I ride so they can trust me and I can trust them. I think that keeps them happy and successful," Suchanek explained as he expressed his optimism for the coming years. "When the horses are mentally and physically ready to develop, they are eager to learn and it's a lot of fun to be able to keep training them up the levels and have them keep progressing." Leatherdale Farms' 17-year-old gelding Devon L's (De Niro-EM Wibranda, Wolkenstein II) experience shone through as he claimed first place in the Grand Prix Open All-Breed award for the American Hanoverian Society with a median 68.292 percent score. Devon L has won the award several times during his successful career and in the 2017 season he earned points with the help of both Diane Creech and her daughter, Vanessa Creech-Terauds, who also began competing in the U25 Grand Prix division with Devon L this spring. "Devon L loves to perform and he has taken me so many places - I will always be grateful to him and to Louise, who has supported us all these years," Creech said. "It makes it even more wonderful as he now is carrying on his legacy with my daughter in the U25 division. Although it can be at times a little challenging to work with a professor who knows it all, they both are making compromises, bonding and becoming more and more of a team." Lastly, the 8-year-old Hanoverian mare Fleur De Lis L (First Dance-EM De La Rosa, De Niro) and Vanessa Creech-Terauds won the American Hanoverian Society's Prix St. Georges Junior/Young Rider division with a median of 69.167 percent. "Riding and growing with Fleur has been an amazing experience and learning opportunity!" Creech-Terauds said. "At shows, she has such a super mindset and really focuses on working with you throughout all of the movements in the test. She has an amazing natural ability to collect, which is super in the pirouettes and she has a nice hind leg. Fleur is so willing and you know that she will always try her heart out for you!"